Valentine’s Day 2015 is upon us. Rather than give a perfunctory “What to Do on Valentine’s Day”, I happened upon an interesting twist in Valentine tradition. Who will you spend your Valentine’s Day with? Is it a happy day of glitzy demonstrations of love with your significant other or a day spent solo curled in a blanket cocoon with a pint of ice cream? This is my third Valentine’s Day with my husband, a Colombian and the only one in his family to have left his home country behind to live in the United States. What began with me questioning “How do you celebrate Valentine’s Day in Colombia?” morphed into a discovery of not only another date but also led to the discovery of the origin where the majority of Valentine’s Day flower bouquets originate from. In his country, Valentine’s Day is not a celebration on February 14th but is celebrated on the third Saturday of September. It’s known as “El Dia de Amor Y La Amistad” or “The Day of Love and Friendship”. Traditionally Valentine’s Day take its root in Roman history of early Christian martyrs named Valentine. There was no early tie between St. Valentine’s Day and romantic love. It is said Chaucer in the 14th century is the first to have equated Valentine’s Day with romance in poetic verse. 1969 is the year that St. Valentine’s Day was removed from the liturgical Roman Catholic calendar and relocated to local and national calendars. It was said to be because little was known about St. Valentine except that he was buried on February 14. The country of Colombia chose a day completely separate to celebrate “Amor” or “Love”. It was established by Colombian law in 1969 as the third Saturday of September. Men serenade their lovers, people celebrate in the streets and schoolchildren gleefully surprise each other anonymously. Couples celebrate romance in Colombia on Amor Y Amistad but the day is seen more of a celebration of family and friends united in love. School children play a game called “Amigo Secreto” or “Secret Friend” where a name is blindly chosen to exchange candy, chocolates, gifts or candy similar to our “Secret Santa” exchanges we do in the United States. I think a catchy American name would be a “Secret Cupid” exchange. When I went to research more about this different Valentine’s Day date in Colombia, I happened upon the enormous role Colombia plays in our American Valentine’s Day tradition of flowers. There’s a very good chance that the fragrant flowers you are purchasing in plentiful amounts for your loved one(s) have found their way to you via Colombia. Yes, my own neighborhood grocery store flowers traveled roughly 2,100 miles to romance me with their splendid array of colors. Wow! The country has unique combination of sunlight, humidity, temperature and soil fertility that lends well to floral growth. My own visit to my husband’s home region demonstrated the broad spectrum of regional weather. 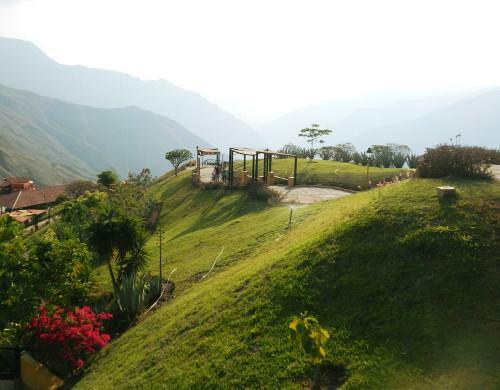 One day was spent in the mountains of the Santander region at the Chicamocha National Park lathered in sunblock and scorched by heat. We climbed aboard a cable car and traveled the 6.3 kilometer (3.9 mile) aerial tramway across the canyon. It’s one of the longest in the world! The air blew cold on the mountaintop across the canyon. It was a vast difference in temperatures. Colombia has the highest number of plant species by unit of area in the entire world! It is home to over 130,000 species of plants and over 50,000 known species of flower. Colombia is the second leading exporter of flowers and the top producer of carnations shipping more than $1 billion in blooms. Over 70 percent of the flowers in the US come from this country known more for its violent political unrest and cocaine trade. The flower production is a crucial component of Colombia’s economic sustainability. The flower importation to the US has been on a steady rise since Congress inked a deal with the South American country to try to curb the influx of drugs pouring in by way of Miami and encourage lawful economy. Tariffs were eliminated on Colombian goods and three other South American countries in 1991. The goal was to boost legitimate industries within Colombia. When this law lapsed in 2011, Colombia and the U.S. reached a free trade agreement that took effect in 2012. Sales (from U.S. exports) increased from $200 million in 1991 to more than $666 million in 2013, according to the Commerce Department. I find pride in my extended family’s floral heritage and the significance it has on our Valentine’s Day in the United States. I also chuckle with the realization that I can give my husband a hard time on February 14 AND the third Saturday in September for flowers and romance. But hey, shouldn’t the celebration of love and friendship be a daily thing, not a once a year type deal? However you celebrate it or whether you choose to boycott it, Valentine’s Day has arrived. I wish you and yours a very Happy Valentine’s Day!